For nine years now every time we have an intermediate degree correction the perma bears crawl out of the woodwork and start screaming the sky is falling. If you had listened to these people you would have missed one of the greatest bull markets in history. We had one of the most destructive bear markets in history in 2008/09. It stands to reason it should generate one of the strongest bull markets. As I’ve noted many times in the past, markets act like a pendulum. The further it swings in one direction the harder the reaction in the opposite direction. Here’s another fact that these perma-bears seem determined to overlook. Bear markets require a catalyst. Bull markets don’t just roll over and die from boredom. In order to produce anything more than just profit taking corrections there has to be a catalyst to trigger a recession. Something has to happen to clamp down on middle class discretionary spending. A trade war squabble with China certainly isn’t going to frighten the middle class into retreating to the bunkers. A marginal bump in interest rates also isn’t going to stop the middle class from buying their daily Latte Macchiato at Starbucks. Since about 1960 the catalyst for all recessions has been inflation. Specifically energy inflation. When the price of oil rises too much too fast it impacts the cost of living expenses. When it starts costing twice as much to fill up the car, and the weekly grocery bill doubles, that is what collapses middle class spending. When the middle class goes into hibernation that’s what triggers a recession and a bear market in stocks. We still need to finish the euphoria phase before this bull market tops. Clearly we haven’t reached that stage yet. 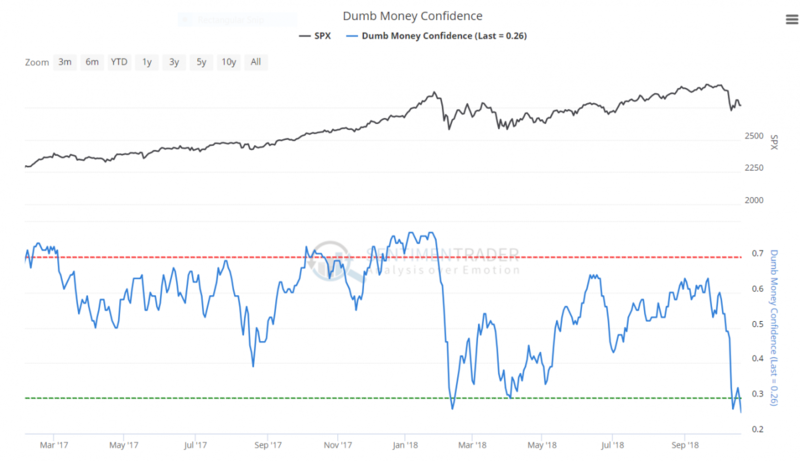 When we do investors will finally become convinced that stocks are immune to any significant risk, and then we will see the stubborn bullishness that characterizes the beginning of a bear market. Right now this is just another profit taking event in an ongoing bull market. And if one can ignore the Chicken Little’s of the world, another dip buying opportunity before the final euphoria phase begins.